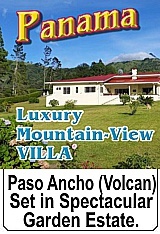 Volcan Panama Real Estate For sale by Owner. 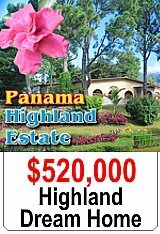 NOTICE: We at YOURPANAMA.COM are NOT realtors and do not accept either commissions or finder's fees. 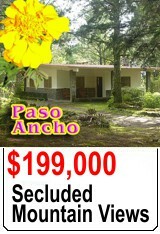 These listings "for sale by owner in Panama" are mainly in the Volcan area and Chiriquí province of Panama. Acreage, Acreage, Acreage! 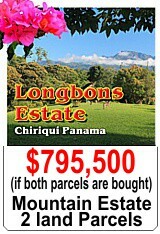 Possibly the most perfect elevation and climate in Panama. 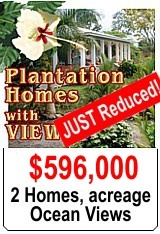 28+ acres of lush tropical farmland with a ranch house. 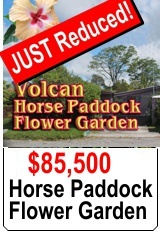 Located halfway between Concepcion and Volcan in Chiriquí province this is ideal for Horses, dairy cattle or fruit and vegetable farming. 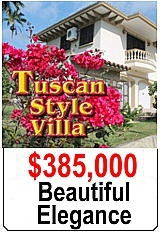 Stunning views to the Pacific Ocean or up to Panama's highest mountain. 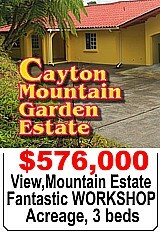 If you want seclusion and to live away from the city noise - this could be your place. 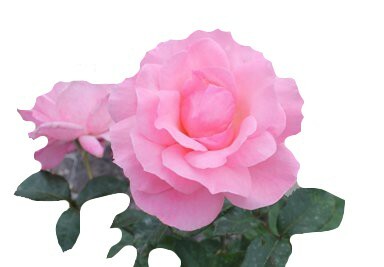 This Flower Garden home, has had hundreds of hours of loving, patient care taken to make the garden as beautiful as possible. 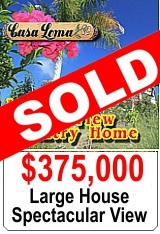 This home has room in the garden to build a separate home or guest casita. It is literally a "stone's throw" from a supermarket, a café, a restaurant and ice cream store. Single story, so there are no stairs to climb. Finally, a clear, view to the majestic, 11,400 foot, Baru Volcano. Eternal spring home with gorgeous view. 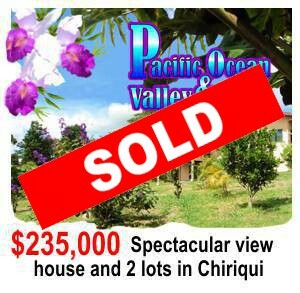 This modern, well built home, that is for sale with an additional adjacent lot is located in the area of Cuesta De Piedra, Chiriqui. It is 15 minutes from the fast growing and bustling town of Volcan and 45 minutes from Panama’s third largest city; David. 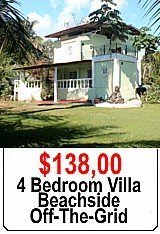 The home is nestled on a hill overlooking the Rio Bregue River. 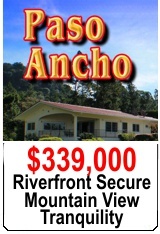 Home and adjacent lot are offered together for $235,000 US. 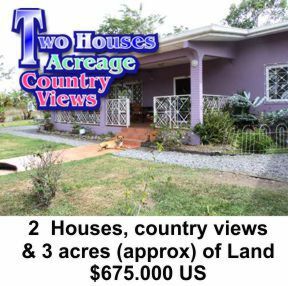 Two Houses and Acreage for Sale. Two North American standard houses on approx. 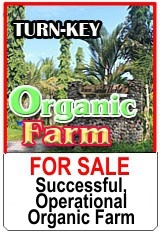 3 acres of land. Centrally located in Volcan - but quiet and peaceful. 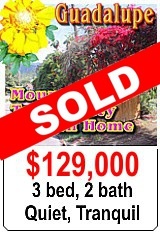 Properly fenced and second house is income producing from day one. 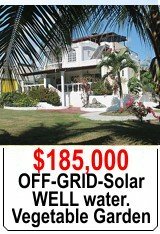 Possibility to add more rental homes. 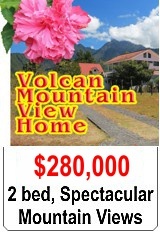 Clear views to the west and just 5 minutes walk into center of Volcan. 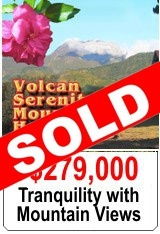 Located with a clear view to Panama’s highest mountain, the 11,400 foot Baru Volcano,this 2 bedroom, 2 bath home has everything for the perfect retirement home. The house is already set up for Wireless Internet connection. Beautiful sunrise and sunset vistas. 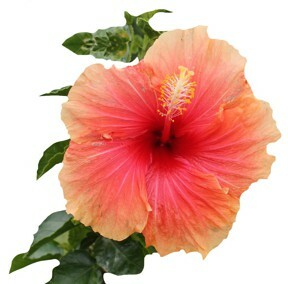 Perfect for pets as the house is completely surrounded by a 6-8 foot security wall. 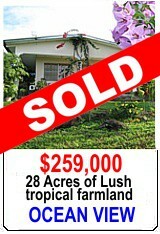 Owners could divide property with house and 1500 square meters of land for $235,000.